A corroded copper and mithral key of just under a foot in length. 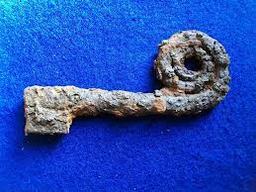 A key of Veles is a corroded copper and mithral key about 1 ft long. When held near a ley line or shadow road, it automatically points to that line or road. If the holder speaks the command word, it opens the shadow road or fey road. Each such use expends one of its 10 charges. After a key of Veles is used 10 times it cracks and becomes useless. The device also opens doors, chests, gates, bards, shackles, chains, bolts, and automatically dispels a Hold Portal spell or even an Arcane Lock cast by a wizard lower than 15th level. This expends no charges. The wielder can make a caster level check against the lock or binding, using the key’s caster level of 14. The DC of this check is equal to the Disable Device DC to open the road, lock or binding. Each sounding only opens one form of locking, so if a chest is chained, padlocked, locked and arcane locked, it takes four successful attempts with a key of Veles to get it open. P.S: One of these items was once in the possession of sorcerer Arcael but sacrificed to THE OLD MARGREVE in order to save the party from an angry Bloodtree.